The Datamax SV-3306 has been renamed to the Datamax-O'Neil SV-3306. 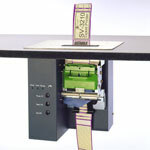 For integrated box office applications, the Datamax SV-3210 and SV-3306 ticket printers are designed specifically for vertically oriented, in-counter installation and operation. Using the same high performance electronics and firmware as the Datamax ST models, the SV printers are designed to eject the printed ticket from the top of the printer utilizing either a manual tearplate, or an integrated rotary cutter mechanism. SV-3306, Direct thermal, 300 dpi, 6 ips, 3.15" print width, parallel & serial interfaces, 4MB DRAM, 1MB EPROM. Includes cutter & US power cord. Order cables separately. See accessories. The SV-3306 was defined to enable Datamax to apply engineering expertise and experience to a specific niche industry. To this end Datamax targeted the admissions ticketing market with the first family of S-Class printers. The ST-3210 and ST-3306 are 203 and 300 dpi versions of the tabletop model, while the SV-3210 and SV-3306 are 203 and 300 dpi versions of the vertical in-counter model. The SV-3306 is an excellent printer for new box office installations as well as for add-on to or replacement of older, difficult to maintain products. Datamax has worked with a number of ticketing solutions providers to certify the S-Class for use with leading software products.